In response to Our Lord's warning we pray, as He teaches in the text of the Our Father: "deliver us from the Evil One". It is in the spirit of watchfulness that we are "on guard" against temptation and worldly anxiety. "'God cannot be tempted by evil and he himself tempts no one'; on the contrary, he wants to set us free from evil. We ask him not to allow us to take the way that leads to sin. We are engaged in the battle 'between flesh and spirit'; this petition implores the Spirit of discernment and strength." -- Catechism of the Catholic Church, paragraph 2846. Meeting Christ in the Liturgy offers a reflection for the First Sunday of Advent. "The world as we know it is passing away"
Pray for victims of terror in Mumbai and elsewhere around the tortured world, "groaning in agony", as it awaits the justice and judgment of God. Archbishop Slattery of Tulsa will celebrate the liturgies of Advent and Christmas in his Cathedral "versus Deum" that is, "toward the Lord" and expresses his hope "that this common posture of the Church at prayer will help you to experience the transcendent truth of the Mass in a new and timeless way" and "that this restored practice will help us understand that at Mass we participate in the authentic worship which Christ offers to His Father by being ‘obedient unto death.’"
Visit "What do Catholics Really Believe?" to find out about FOCA and resolve to fight this law which the President-elect has promised to sign and which will, when passed, replace Roe v. Wade as the law of the land, legalizing a supposed "right" to end the lives of unborn children, discovered and "legislated" by the Supreme Court in 1973. Meeting Christ in the Liturgy offers a reflection for the Solemnity of Jesus Christ, Universal King. 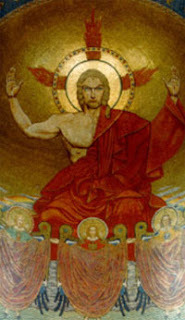 (Photo: Christ in Majesty, National Shrine of the Immaculate Conception. 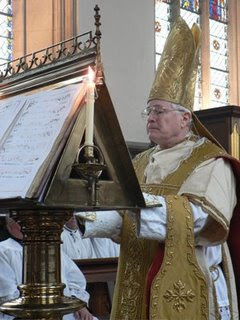 "We also approved, after intense discussion, and a number of amendments, many prayers to be included in the new missal. Our readers may wonder why the church is, once again, looking to change the prayers at Mass, which we have been praying now for many years. Let me say, that I am entirely supportive of this change. The new translations restore a certain sacredness to the words in these prayers. "My old friend and former colleague, Archbishop Al Hughes, served on a commission in Rome, where he goes several times a year, called “Vox Clara” (“Clear Voice”). The archbishop, like myself, graduated from Boston College High School, but I dare say he is a much better Latinist than I am. Remember, the church has very little experience with Mass in modern languages. For 500 years, the text of the Mass of the Roman rite was Latin, which at one time was almost a universal language. "The effort was to protect the sacredness of the text, and also to protect sound theology. 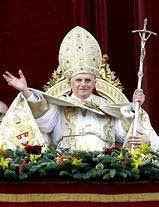 An excellent job has been done, and we expect within a few years there will be a whole new translation of the Mass. I am not anxious about that change. I welcome it and support it. that if we catechize and teach properly, if we explain the reasons for it and show that this is better and more beautiful, our people will rally behind it. It is a pastoral task, which we can face together. "Also, the Mass is not something that we make up. We receive it as a gift, an enormous and ineffable gift from Christ through the church. This translation would be better English, more sacred, and will help us to pray. It is a change, which is foundational and helpful and will require the collaboration of all of us. "Also, this is favored by the Holy See, and a keen obligation of the bishop is always to be in communion with the successor of Peter." --His Excellency the Most Rev. John M. D’Arcy of the Diocese of Fort Wayne – South Bend on deliberations at the November conference of the USCCB. Why are they smiling? 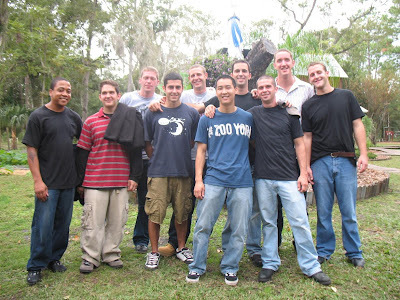 They had a life with drugs and are now discovering a life with God. They are Comunita Cenacolo, the "Community of the Cenacle". Read more at Hope Reborn. Mosaic floors like a tapestry 2,000 years old. Ruts worn in the surface of a Roman road mark the daily path of oxcarts and chariots. Drainage canals run between the palaces of the wealthy to carry away rain water, garbage and sewage. An ancient Greek votive temple was buried by the Romans and walled off in respect for the customs of the ancients. Precise temple designs proclaim the glory of the Creator as reflected in human gifts of intellect, design and labor. A special greeting to Deacon Tom, Judy and family whose "cognome" graces a town along the Tirrhenian sea coast between Paestum and Salerno. The boredom of a sick and decadent "cult of death" has found a new source of entertainment in desecration of the Eucharist. A new video on YouTube taunts and threatens, the producer promising to go to Mass every day and smuggle the Eucharist out of the church in order to desecrate and videotape the sacrilege as a new source of amusement. You can request that YouTube pull the offending videos by visiting America Needs Fatima and using the on-line form provided. 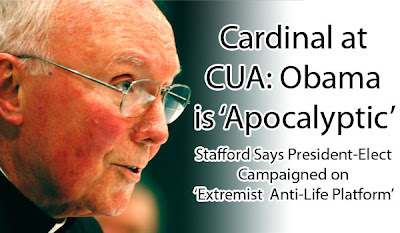 Agenda "Aggressive, Disruptive and Apocalyptic"
See more on Cardinal Stafford's comments delivered at CUA as reported November 14th in "The Tower". We are the servants of God, and are responsible to God for the way we use the abilities he has given us. How we use our abilities to enrich and help others is our fulfillment of Christ's command to love others as we love ourselves. On the natural level, God equips each one of us with unique talents, abilities, and aptitudes. No one person will ever be exactly like another or have the ability to excel in every discipline. All the plastic surgery, diets, workout programs, steroids or makeup in the world cannot change this fact. Happiness lies not in changing our physical appearance to be like someone else; it lies in fully realizing our God-given identity of talents and gifts through a virtuous and generous life. Recognizing and accepting God's plan for each of us is essential for our happiness. C.S. Lewis wisely wrote, in The Problem of Pain, "When we want to be something other than the thing God wants us to be, we must be wanting what, in fact, will not make us happy." Meeting Christ in the Liturgy offers a reflection for the 33rd Sunday in Ordinary Time. Franciscan University of Steubenville students were very visible and very audible at the audience last Wednesday. Sustained and loud cheers for the Holy Father rang out and cries of "We love you, Papa" were heard when the group was announced to the crowd of pilgrims gathered in Saint Peter's square. Above: Members of the choir of Saint Andrew the Apostle Church in Silver Spring, Maryland, sang for the Holy Father when their group was announced. Watching the election returns in Italy and learn­ing the identity of the victor I immediately thought of the need for prayer, remembering as I did that, once, another national leader, also with a mellifluous voice and photogenic appearance, blinked, show­ing weakness in the face of a foreign enemy. The people paid the bill. Pray for strength in righteous­ness and justice among those who lead us! “I will sing of loyalty and of justice; to thee, O Lord, I will sing. I will give heed to the way that is blameless. Oh when wilt thou come to me? "I will walk with integrity of heart within my house; I will not set before my eyes anything that is base. I hate the work of those who fall away; it shall not cleave to me. "Perverseness of heart shall be far from me; I will know nothing of evil. Him who slanders his neighbor secretly I will destroy. Let us be loyal Americans, and good Catholic Christians. Let us pray faithfully and sincerely for our civil leaders, for their good and for our own good as “ one nation under God.” Let us pray for conversion to the cause for life: each and every human life. But let us also “ Render unto God” and go daily to prayer that we may continue to inter­cede for the voiceless unborn and for conversion of all to the truth that every human person indeed is created with the “ right to life” from the moment of conception. Without the right to life there can be no right also to “ liberty and the pursuit of hap­piness” for millions of our unborn fellow citizens: brothers and sisters in Christ the Lord and Creator God. In this way we will be a true “ leaven in the world” in fulfillment of our baptismal vocation, our calling to be authentic disciples of Christ. In keeping with our call to holiness and the source of grace in Christ, our Holy Father charts the way forward for us in his address at the close of the Synod in Rome on the Word of God. Fol­lowing is part of the text. “All of us who have taken part in the work of the synod will carry with us the renewed knowl­edge that the Church’s principal task, at the start of this new millennium, is above all to nourish ourselves on the word of God, in order to make more effective new evangelization, the announce­ment of our times. What is needed now is that this ecclesial experience reach every community; we have to understand the necessity of translating the word we have heard into gestures of love, because this is the only way to make the Gospel announce­ment credible, despite the human weaknesses that mark individuals. What this requires first of all is a more intimate knowledge of Christ and an ever­more docile acceptance of His word. “In this Pauline year, making the words of the apostle our own: ‘ I should be in trouble if I failed to [ preach the Gospel]’ ( 1 Cor. 9: 16), I hope with all my heart that in every community this yearn­ing of Paul’s will be felt with ever more convic­tion as a vocation in the service of the Gospel for the world. At the start of the synod, I recalled the appeal of Jesus: ‘ The harvest is rich’ ( Matt. 9: 37), an appeal we must never tire of responding to whatever difficulties we might encounter. So many people are searching for, sometimes unwittingly, the meeting with Christ and His Gospel; so many have to find in Him a meaning for their lives. Giv­ing clear and shared testimony to a life according to the word of God, witnessed by Jesus, therefore becomes an indispensable criterion to verify the mission of Christ. “Ongoing efforts to give life to the biblical movement among lay people should be encouraged, along with the formation of group animators, with particular attention being paid to the young. We must also support the effort to allow faith to be known through the word of God to those who are ‘far away’ as well and especially those who are sincerely look­ing to give a meaning to their lives. . . .
“Many other reflections should be added, but I will limit myself to underlining that the privileged place where the word of God rings out, that builds the Church, as has been said many times during the synod, is undoubtedly the liturgy. In this is where it appears that the Bible is a book of a people and for a people; an inheritance, a testament handed over to readers so that they can put into practice in their own lives the history of salvation wit­nessed in the text. There is therefore a reciprocal relationship of vital belonging between the peo­ple and the Book: The Bible remains a living Book with the people which is its subject which reads it; the people cannot exist without the Book, be­cause it is in it that they find their reason for liv­ing, their vocation and their identity." Christ is the Way. In the “words” of the Scripture, by means of prayerful meditation and wholehearted praise, we encounter and grow in love of the “Word” Himself, our Lord Jesus Christ, above all in the word and sacrament of the Sacred Liturgy. And, in the grace of His love, people of the Eucharist, we are ca­pable of “loving gestures” as His voice, His face, His presence in the world! We are thus “credible” wit­nesses, calling the world to also believe, as do we, in Jesus Christ as Lord. 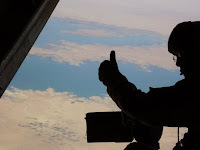 Please visit and enjoy as I do the serious, stirring and strengthening blog, In Caritate Non Ficta, by Philip Gerard Johnson, currently under treatment for a brain tumor. Keep him in your prayers, please, as he wishes to pursue his call to priesthood by entering the seminary. BALTIMORE—The U.S. bishops approved the Order for the Blessing of a Child in the Womb for use in the dioceses of the United States with a 223-1 vote November 11, at their General Assembly in Baltimore. The bishops also approved a Spanish version of the blessing with a 224-0 vote. The Blessing of a Child in the Womb was prepared by the USCCB Committee on Pro-Life Activities after receiving requests from dioceses for such a blessing and not finding an existing blessing for a newly conceived child. In March, 2008 a blessing was prepared and submitted to the Committee on Divine Worship. The proposed blessing is distinct from the Blessing of Parents before Childbirth found in the Book of Blessings. The Blessing of a Child in the Womb Within Mass and Outside Mass, in English and in Spanish, upon recognitio by the Congregation on Divine Worship and the Sacraments in Rome for use in the dioceses of the United States of America, will be included in future editions of the Book of Blessings (de Benedictionibus) when the text is revised. Read about Effort to Steal Communion Hosts Thwarted by Priest at "What do Catholics Really Believe?" It is when we know that death is near that we loose our fear of loving. The grace of confronting the evidence of our life's end can awaken in us the pure gift of accepting the other as only true loving is able. Loving as Christ loves: no conditions, no prenuptial agreements, no desire for a return of any kind. A love without "utility", lacking any seeking whatsoever for reward. A love whose reward is found only in the giving of love. This is the recklessness of love - the love of the Crucified, whose total gift of Self is the grace, source and gift of all love truly worthy of the name. Peace be with you, friends far and near. Ancient tradition makes it possible to establish the following. Paul suffered martyrdom near Rome at a place called Aquae Salviae, now Tre Fontane, somewhat east of the Ostian Way, about two miles from the splendid Basilica of San Paolo fuori le mura which marks his burial place. The martyrdom took place towards the end of the reign of Nero, around the year 63 or 64 A.D.
"And thus we came to Rome. The brothers from there heard about us and came as far as the Forum of Appius and Three Taverns to meet us. On seeing them, Paul gave thanks to God and took courage. When he entered Rome, Paul was allowed to live by himself, with the soldier who was guarding him." 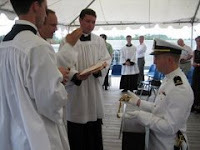 A young Catholic Naval officer and graduate of the Naval Academy, Philip Gerard Johnson, recently learned that he has a brain tumor while on a six-month deployment. He has returned to the United States where doctors have informed him that his cancer is inoperable. He has started a blog, In Caritate Non Ficta. Please visit and let him know of your prayers and support. I deeply appreciate the collaboration your office has extended to me and my brother bishops in advancing legislation which is beneficial to the poor and the destitute throughout the United States, and, indeed, the world. It is as a collaborator for the common good, and as pastor of the Church in Pensacola-Tallahassee that I write to you with similar urgency. I learned recently of your visit to the diocese during the political campaign and that you attended the celebration of Sunday Mass in a local parish. The Church of Pensacola- Tallahassee welcomes all people of good will, all the baptized to pray with us. In particular, we welcome our fellow Catholics who seek to fulfill their Sunday obligation in a spirit of communion by participating in Sunday Mass. Sunday Mass provides Catholics with the nourishment to live in the image of Jesus Christ whose mission is directed to the orphan and the widow, to the poor and the vulnerable.The principles of right reason, knowable to all even beyond the categories of faith, attest the common good is served only when the least of our brethren are accorded full rights correspondent to their inviolable dignity. Thus, human life is to be respected from the moment of conception until natural death. The Church has taught this from the beginning,and civilized societies live by this principle. Our worship of God during Sunday Mass, which culminates in the reception of Holy Communion, is precisely the moment when we are nourished and strengthened by the Holy Spirit’s gift of courage to stand up in fortitude to protect the weakest among us. The Eucharist, as the real presence of Christ, is also the sign of our unity as a Church, which is built on sharing in the mission of Christ to protect the defenseless. While grateful for the effective collaboration you and your office have offered on so many worthy projects and concerns, I also observe, by your support for laws that fail to protect the unborn, a profound disconnection from your human and personal obligation to protect the weakest and most innocent among us: the child in the womb. I pray that the Catholic faith you have been raised in, the faith by which you pray, and the life of virtue which flows from both may strengthen you so that you may have the strength needed to witness Jesus, even as the martyrs did, and live by the virtue of fortitude as you proclaim your support to the Person of Christ in the most vulnerable of his members: the pre-born child. You are, Senator, always welcome to nourish such a faith within the Diocese of Pensacola-Tallahassee. Views of the town of Positano and the coast near Amalfi at Santa Croce beach. Paestum, or Poseidonia, is well known for the temple structures surviving in their entirety and has roots going back to before its days in the 6th century before Christ both as an important port of Magna Graecia, or the greater Greek empire, and later passing into Roman hands with the rise of that empire. "We put in at Syracuse and stayed there three days, and from there we sailed round the coast and arrived at Rhegium. After a day, a south wind came up and in two days we reached Puteoli. There we found some brothers and were urged to stay with them for seven days." La Villa Arianna, 79 A.D. The Villa Arianna, or House of Ariadne, is named for the mythical figure of that name who is pictured in one of the surviving frescoes in this complex of Roman structures near Castellamare di Stabia on the Bay of Naples. This Roman complex was lost along with many others in the eruption of Vesuvius in 79 AD. The waters of the Bay have now receded from their former point adjacent to the villa, built on a promontory and structured to accomodate visitors and supplies by boat from the Pomepii and other ports.